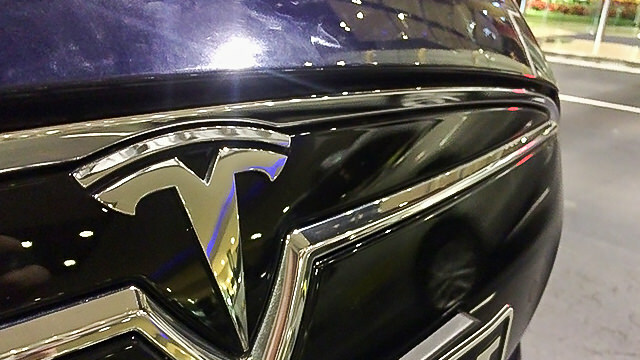 Having been a long time follower of Tesla Motors, both the products and the company activities, and with the company recently launching their range here in Oz, the opportunity to test drive one of the new cars crossed my social network feeds. Boy did I jump at the chance! 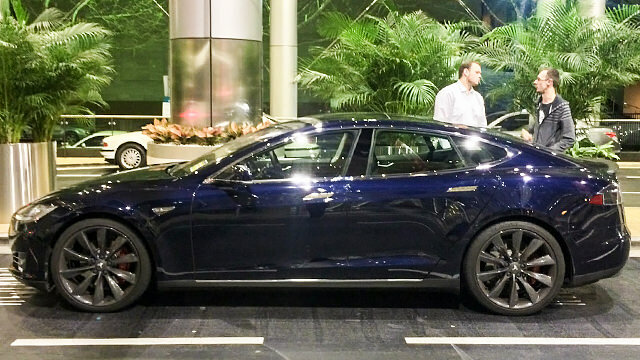 The day arrived (I was more than a little excited…) and the kit that awaited me was a Dark Blue Tesla Model S P85+. That's basically the top model, with options. Yours, on the road, for AUS $176,000 (GBP 95,000)! Can we get geeky? Let's! This thing weighs 2100kg, does 0-100kph in 4.4 seconds, has 21 inch wheels and a 17” (multitouch) touchscreen as the centre console! A third of that weight is the batteries, 700kgs of Lithium-ion cells slung under the body, below the axle line, for optimal weight distribution. Its truly an awesome machine. I remember reading that during the crash testing process, the Model S broke the teasing rig for the rollover strength test! 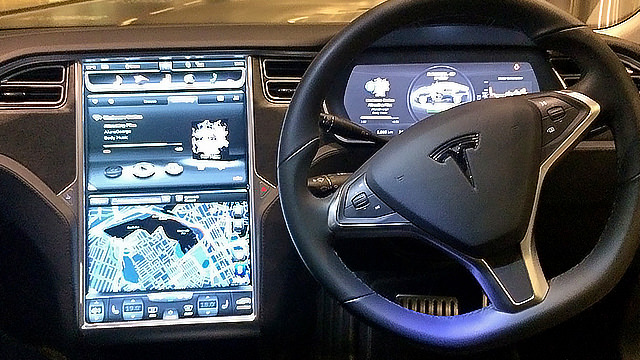 The Model S doesn’t feel its weight while driving it, with the driver able to control the air suspension, steering and throttle response via the touchcreen on the fly to suit their taste or situation (firm suspension and heavier steering please). Driving a car that makes no engine noise most of the time is an odd experience. The noise only comes when you give it a good pedal, even then, its a dull, supercharger-y sound from the back, and holy smoke does it go! The speedometer, is also displayed on an LCD where it normally sits, with a cool little ECG looking graph representing power in and out of the battery system next to it. To tie this back to F1 and the involved technologies, the Telsa has a regenerative braking system, which kicks in when you take your foot off the accelerator pedal. The system gives the feel of moderate braking force without actually touching the brake pedal, just lifting off, which takes some getting used to. You only need to use the brake pedal when you want to come to a complete halt, or need to slow down in more of a hurry. If the the system in the Tesla is similar to the 2014 F1 setup, i can certainly see how some drivers struggled with it initially. A great time was had geeking out with the amazing technology and the Tesla sales guy (also an engineering grad) had an answer and discussion for every question we threw at him. If this is how cars are heading for the future, I’m very interested. Yay, electricity!